The Pawnee Massacre took place on August 5th, 1873. It took place in what is today Hitchcock County, Nebraska. ﻿Some have described it as the Massacre Canyon Battle, one of the last "battles" between the Pawnee and the Sioux, and the last large-scale "battle" between Native American tribes. Of course battles usually mean warriors, soldiers, clashing with one another on a battlefield. Instead, what took place on August 5th, 1873 in Nebraska was not a battle. It was a massacre. Those killed were mostly women and children. Many hearing the words Indian Massacre would automatically assume that it was the work of the U.S. Army. That is the common narrative. What most don't realize is that Native Americans tribes waged genocidal war on each other, tribe versus tribe, since the dawn of time. Yes, long before Europeans ever set foot on North American soil. Long before Columbus found the Bahamas. Sioux versus Pawnee: It was "Total War" between the two nations. Historian Mark van de Logt wrote: "Although military historians tend to reserve the concept of “total war” for conflicts between modern industrial nations, the term nevertheless most closely approaches the state of affairs between the Pawnees and the Sioux and Cheyennes. Both sides directed their actions not solely against warrior-combatants but against the people as a whole. Non-combatants were legitimate targets. It is within this context that the military service of the Pawnee Scouts must be viewed." The massacre occurred when a combined Oglala/Brule Sioux war party of over 1,500 Sioux warriors attacked a small party of Pawnee men, women and children who were on their summer buffalo hunt. They were there trying to stave off starvation. The Platte and Republican Rivers in Nebraska was home to the Pawnee Indians. The Pawnee are said to have been a semi-nomadic people, but they maintained permanent structures such as mud-huts in villages in the Eastern part of Nebraska. On the overall, Pawnee farmed. They planted corn, beans and squash. They were in complete contrasted to the Comanches, the Sioux, the Cheyenne, and others who ranged over vast areas of the Great Plains. They lived in tipis and relied almost entirely on the hunt for food and shelter. While they did farm, like most other Plains Indians, the Pawnee depended primarily on the buffalo for subsistence, for food, hides, and yes, even trade with whites. Twice a year, once in the early summer and again in the fall, Pawnee men, women and children traveled from their mud-lodge villages to find the buffalo and their herds. As most know, one gift from the Europeans to the American Indian was the horse. Horses that once belonged to the Spanish became free and multiplied. Tribes gathered them, and they in turn gave the natives great mobility. As never before, because of the horse, the American Indian could travel further in a given amount of time, pack more supplies, and return with greater amounts of meat and hides. And yes tribes honed their skills as mounted warriors, some tribes being better than others, and their ability to conduct mounted warfare became legendary. The buffalo was important to the Pawnee, as was with other Plains Indian nations. Besides food, shelter, and trade, the buffalo had a religious significance to native Americans that actually spanned most tribes, even when they didn't have language and other customs in common. Yes, whites even today make the mistake of lumping all Native American Indian tribes in one basket because they occupied areas of the North American continent. But that's as ridiculous as saying the Germans are the same as the French because they occupy areas of Europe. Most of the Pawnee religious ceremonies required offerings of buffalo meat. Pawnee lodges contained altars with buffalo skulls. To the Pawnee, buffalo were nearly as important as maize which they referred to as "Mother Corn." The Pawnee considered Southwest Nebraska as their rightful home, and the buffalo, which ranged there, as their own. For a long time, the Pawnee were able to keep their "homeland" relatively free from "foreign" intruders. The word "foreign" has an interesting connotation, fact is to the Pawnee the Sioux were considered "foreign" intruders just as the whites were. Through a series of treaties the U.S. Government extended its influence onto the Great Plains, encroaching on the traditional Pawnee lands and their great buffalo herds. From the 1840s to the 1870s, the Pawnee people were severely weakened by famine, disease, and war with other Plains Indian tribes. 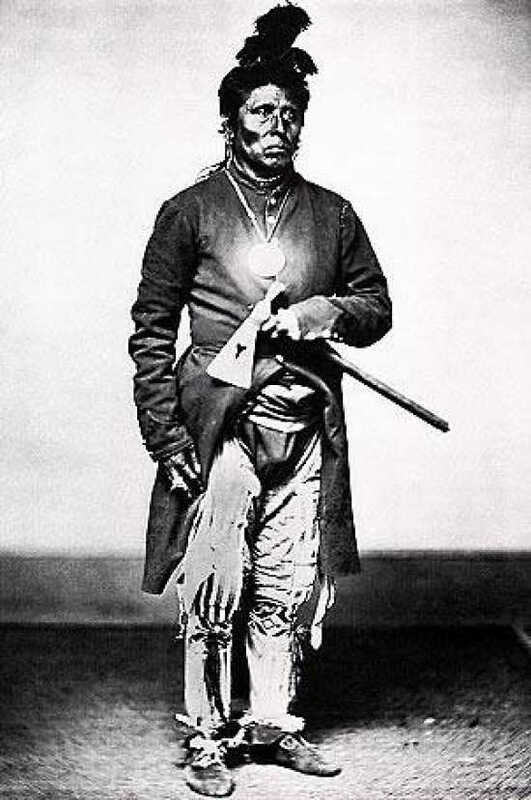 As a survival measure, many Pawnee warriors allied themselves with the U.S. Army, as Pawnee Scouts, and participated in the Army's campaigns against the Sioux who were among their traditional enemies. As I stated earlier, the Pawnee and the Sioux had been waging war for hundreds of years before Europeans, the whites, ever stepped foot on North American soil. In the decade of the 1860s and 1870s, the railroads moved West, and they were followed by waves of American homesteaders. Then came the policy of the U.S. Army to destroy the Indian's primary food source, and thus came the wanton destruction of the buffalo by white hunters. The buffalo hunters either provided food for the railroads, slaughtered bison for the hides, or simply were in on the extermination of the food supply of the Indians tribes. Yes, all part of the horrible policies of some U.S. Army Generals. This, along with the hunting of the various Plains Indian tribes, severely limited the Pawnee's means of survival. Then by 1873, the Pawnee were confined to a reservation in Nance County, near Genoa. There their population had shrunk to some 2,400 people, with about 600 warriors in all. They were on the verge of starvation, but that summer the Genoa Indian Agency Superintendent allowed a summer buffalo hunt. As it turned out, it would be their last one. A young Genoa Agency employee, J. W. Williamson, was assigned to accompany the hunt, to generally keep a tight rein on the hunting party. He reported, "On the 2nd day of July, 1873, the Indians, to the number of 700, left Genoa for the hunting grounds. Of this number 350 were men, the balance women and children. The men carried bows and arrows, some old fashioned muzzle loading rifles, and a few Spencer Carbines. All were mounted, and in addition they took with them 800 extra ponies to pack home the meat and hides from the hunt." The hunt had gone well, and by August 4th the expedition had reached the north bank of the Republican River, near Trenton and went into camp. Williamson received a report that a large band of Sioux warriors were camped only 25 miles to the northwest and were awaiting an opportunity to attack the Pawnee. Williamson believed his informer, and passed the report on to Sky Chief, the senior Pawnee leader of the day. Sky Chief, having heard similar reports many times before, was adamant. Williamson, years later, said, "On the fourth day of August we reached the north bank of the Republican River and went into camp. At 9 o'clock that evening, three white men came into camp and reported to me that a large band of Sioux warriors were camped 25 miles northwest, waiting for an opportunity to attack the Pawnees for several days, anticipating that we would move up the river where buffaloes were feeding." "Previous to this, white men visited us and warned us to be on our guard against Sioux attacks, and I was a trifle skeptical as to the truth of the story told by our white visitors. But one of the men, a young man about my age at the time, appeared to be so sincere in his efforts to impress upon me that the warning should be heeded, that I took him to Sky Chief who was in command that day, for a conference." "Sky Chief said the men were liars; that they wanted to scare the Pawnees away from the hunting grounds so that white men could kill buffaloes for hides. He told me I was squaw and a coward. I took exception to his remarks, and retorted: 'I will go as far as you dare go. Don't forget that.'" Remember, Indian agent John W. Williamson, who accompanied the hunting party, reported, "On the 2nd day of July, 1873, the Indians, to the number of 700, left Genoa for the hunting grounds. Of this number 350 were men, the balance women and children." "The following morning August 5th, we broke camp and started north, up the divide between the Republican and the Frenchman Rivers. Soon after leaving camp, Sky Chief rode up to me and extending his hand said, 'Shake, brother.' He recalled our little unpleasantness the night previous and said he did not believe there was cause for alarm, and was so impressed with the belief that he had not taken the precaution to throw out scouts in the direction the Sioux were reported to be. A few minutes later a buffalo scout signaled that buffaloes had been sighted in the distance, and Sky Chief rode off to engage in the hunt. I never saw him again." It's true that Sky Chief did not believe that it was necessary to throw out scouts in the direction where the Sioux were reported to be. And yes, he was wrong. The Pawnee were traveling along the west bank of the canyon, which runs south to the Republican River, when the 1,500 Sioux warriors attacked. It was not more than a mile up the canyon where the Pawnee ran into the first of some 1500 Sioux warriors, under the command of the Brule Sioux Chief, Snow Flake. Even though the Pawnee women and children had been ordered to take cover at the first sight of the enemy, the entire Pawnee party was soon overrun. "He [Sky Chief] had killed a buffalo and was skinning it when the advance guard of the Sioux shot and wounded him. The Chief attempted to reach his horse, but before he was able to mount, several of the enemy surrounded him. He died fighting. A Pawnee, who was skinning a buffalo a short distance away, but managed to escape, told me how Sky Chief died. The Pawnees were putting up a splendid fight, but the odds were against them ... The Pawnee chiefs noticed that the enemy was surrounding the head of the canyon and gave orders of retreat. Facing annihilation, the Pawnee retreated down the canyon, leaving behind their dead, their provisions, their buffalo meat. Six or seven hundred Indians, men women and children, and as many ponies, all huddled together and going down the canyon, with a thousand or more thirsty savages shooting down on them. In some places the canyon was quite narrow, and caused them to almost stop, then was when the most of the lives were lost." View looking southwest from Massacre Canyon monument, on south side of U.S. Highway 34 northeast of Trenton, Nebraska. The canyon runs down to the Republican River. While many refer to the area pictured above as a "small canyon," to me looks more like an open valley or a shallow draw with no real defenses. To me it looks like a bowl to slaughter one's enemy, especially if your enemy is one foot and you are on horseback and can run them down. Remember, on July 2nd, it was reported that 700 Pawnee left Genoa. They were made up of 350 men, and 350 women and children. In the short "battle", at the end, the wounded were numbered in the hundreds. It's said that the Sioux killed more than 80 Pawnee, mostly women and children. They lay dead among the wounded. Of those who were not dead, wounded, or who did not escape, a number of Pawnee women and children were taken captive as slaves. The slaughter was genocidal. No telling how many wounded died later after the battle. The Sioux's massacre of the Pawnee resulted in the Pawnee Nation relocating from their Nance County Reservation to the Indian Territories in what is now Oklahoma, where they reside to this day. In 1923, the citizens of Trenton sought to commemorate the Massacre Canyon "battle." Supposedly, they brought in some Lakota Sioux Indians from the Pine Ridge Reservation in South Dakota to celebrate this last "fight" between the Pawnee and the Sioux, in what was to become an annual celebration, known as The Trenton Pow Wow. It was not until 1925, two years later, that the committee was able to bring in a Pawnee for that event. At the 1925 celebration, the plan was that representatives from the Pawnee and Sioux Nations should smoke the peace pipe and formally end hostilities between the two tribes. Even after 50 years, feelings between the two tribes ran deep. It was not until the second day of the 1925 celebration that the Pawnee could be persuaded to sit down with the Sioux and smoke the Pipe of Peace. And that, that act officially ended hostilities between those old adversaries. And in effect, it marked the end of the Indian wars in America. While white Americans have acknowledged a lot of what took place, when it comes to waging war, the many American Indian tribes were also incredible fighters who were extremely skilled at warfare. What they lacked in advanced technology compared to the whites, they made up for in lightning attacks, outstanding tactics, and extremely intelligent use of the terrain. While it is true that Europeans waged war on the Indians, we should keep in mind that the multitude of tribes waged horrible brutal war almost to the point of ethnic cleansing on each other for over a thousand years before whites ever step foot on this land. From all that I have read, what the Indians did to each other before the advent of the whites makes what the whites did to them pale in comparison. No, they were not what some think of as "close to the earth, one with nature, peace loving peoples." That is a rewrite of history that some today are painting them to be. Don't fool yourself, neighboring tribes fought each other no differently than neighboring European nations had done for a thousand years and more. During my travels around our great nation, I've made a number of friends in many tribes. I've found that most find it absolutely insulting when people lump them together with other tribes. Trust me when I say that the Cheyenne and the Pawnee do not want to be lumped with the Sioux. And of course, the opposite is true as well. For some odd reason, people today want to lump all of the individual American Indian tribes into this thing called "Native Americans". They forget, or simply don't realize, that tribes had separate languages, cultures, traditions, customs, laws, and even religious beliefs. Some were farmers, some truly nomads, some were hunters, and some were combinations of all of the above. Some build fortresses to keep other tribes out, and some simply moved when they were threatened. And before horses were introduced to North America by the Europeans, specifically the Spanish, they walked and were not mounted warriors. Though neighbors, in most cases they could not even communicate with each other because their languages were so different. If you wonder how this could be, remember that Germany and France share a common border and have been neighbors forever, but they speak completely different languages and have very little in common culturally. Yes, as I stated earlier, just as the Germans and the French are distinct and different nations from each other on the continent of Europe, so were the Indian nations here distinct and different nations in North America.Like the Europeans, Indian tribes fought each other with extreme viciousness. As for why they waged war on each other? When I'm asked why? I always say that it's for all of the same reasons that all nations go to war. These include wealth, power, to gain land, to aid allies, to retain land, politics, and freedom. Some war for freedom's sake, some out of fear of conquest, some war out of the desire for land, wealth, and of course there were Chiefs who waged war because they sought power and dominance over others. Some wage war simply because of a tradition of hate for others. Just like any other nationality in the world, the American Indian nations waged war for food and water, because of religious beliefs and rites within their culture, and of course because that's what they did for so many years. As for cultural differences, even the American Indian didn't accept all this stuff about diversity being good. Remember how the Cheyenne, the Osage, the Lenape, Shawnee, Caddo, Comanche, Kiowa, Wichita, and the Seminole joined forces to attack the Tonkawa Indians because they wanted to put an end to the Tonkawa cultural practice of cannibalism. The objective of those allied tribes was to exterminate the Tonkawa once and for all. It was the Tonkawa Massacre of 1862, and the Tonkawa tribe were almost completely wiped out. It is still the largest Indian massacre on the North American continent and it was between tribes. While there are good reasons to go to war, such as stopping attacks and abductions by cannibals, it seems to me that there is one part of the human condition that has not evolved to the point of extinction. That condition is hate and the desire to kill just for the sake of killing another. All the Pawnee wanted to do was hunt enough buffalo to stop from starving that winter. The Sioux saw the Pawnee hunting party, the majority being women and children. And all they saw were simply targets of opportunity, and they took it to hellish proportions. And yes, those they could not kill, they took for slaves. And yes, for a Pawnee that must have been worse than death itself. Very well written. My best friend as a child was a full-blooded Sioux. He was very proud of his tribe's warrior culture, and was disgusted by modern Indians and whites painting Indian tribes as some sort of peaceful, innocent victims of the Europeans. He would be quick to tell anyone that his tribe fought whites as well as other Indian tribes, and in the end, they lost to the Europeans. He didn't hate the whites for that, he respected them. great take on this, very few Americans know much if any at all about the culture/traditions/lives of these tribes. I was looking for information to confirm the relations between the Pawnee and Sioux as was shown in the film Dances with Wolves and did assume the information was correct in the movie. Your story does confirm that as they were not friendly with one another. Good information, well written.